It’s said that your surroundings influence your creative output. For Nick Cologero, those surroundings are enviable: the tiny hamlet of Olivebridge in upstate New York, flanked by the forests, trails and streams of Catskill Park. From his home workshop Nick runs Catskill Mountain Customs Inc. He?s a full-time firefighter, but spends his down time building bikes and handling small fabrication jobs. This foxy Honda CB350 is his latest build?and it’s a far cry from the sorry state it was in when Nick first laid hands on it. 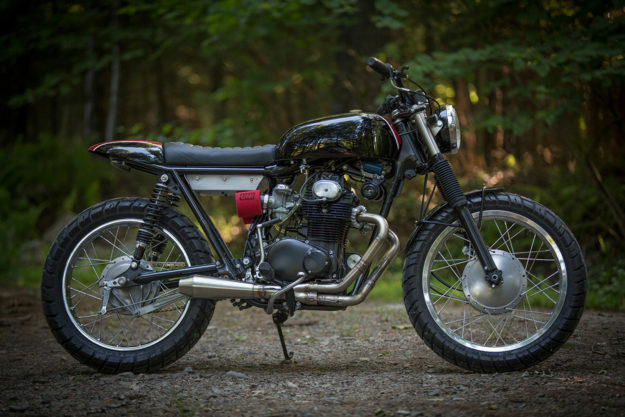 ?It began as a bone-stock ’72 Honda CB350 that sat non-running for over 20 years,? he says. ?It was complete, but just about every part was rusted, dented or seized. I picked it up knowing that it would be perfect for a future build.? Sure enough, a customer soon came along looking for a café racer. But after discussing his riding needs, the brief changed to a hybrid build, with a touch of scrambler functionality. ?It needed to be a bike that he could ride around his property in Cape Cod, and then take into town for lunch,? explains Nick. ?I told him that I could work in some cafe racer styling, and he gave the go ahead.? Nick decided to start with the rolling chassis and work his way inwards. He lopped off the CB350’s stamped steel subframe, and fabricated a replacement. He also factored in a gentle upsweep and new shock mounts, so that he could fit longer shocks without tilting the bike forward and affecting its geometry too much. Next the front forks were rebuilt, fitted with new boots, and capped off with hand-made stainless fork ears for the headlight and turn signals. Nick also re-laced the wheels with new spokes and wider rims, with the front bumped up to 19? for more stability off-road. They’re sporting new Shinko dual-sport rubber. Then it was time for Nick to fashion new bodywork. He?s self-taught, and handles just about every aspect of a project himself?right down to the engine and mechanical work. But it’s metal shaping that really butters his toast. ?It’s something that will keep challenging me for the rest of my life,? he tells us. ?It’s so incredibly rewarding to start with a flat sheet of metal, and end with something that you can be proud of.? ?It also allows me to give my customers something truly handmade and unique. I really geek out studying builders like Bryan Fuller and Christian Sosa.? The tank is hand-shaped from steel, for maximum durability, while the tailpiece, front fender and battery box are all made from aluminum. ?I planned for the rear cowl to add a little café racer style, while also acting as a guard for flying debris kicked up off-road,? explains Nick, ?Everything was rubber-mounted in multiple locations to help with the off-road abuse. ?